In 1969, experimental composer Alvin Lucier designed a simple project with a not-so-simple intention. He sat in a room and made a short recording of his voice, which he then played back into the same room and re-recorded. 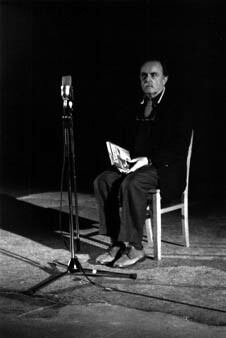 Lucier then re-recorded the re-recording, and repeated this process over and over again, making copies of copies until his voice became completely unintelligible. However, he found that the shape and size of the physical space emphasized certain frequencies over the course of the process – so what you’re hearing by the end of the actual “piece” is the room’s natural harmonic tendencies. In effect, Alvin Lucier turned his room into an instrument. The work was appropriately titled, I Am Sitting in a Room. Last year, YouTube user canzona took inspiration from Lucier to begin his own project, I Am Sitting in a Video Room, which came to conclusion just last month. canzona did the same thing as Lucier, only with a YouTube clip; he uploaded a video of himself, ripped it from YouTube, re-uploaded it, and repeated the process 1,000 times. It’s worth noting that in the updated version, the project shows how the internet and all digitized information produce unexpected phenomena the same way physical environments do. At work in canzona’s project are the “artifacts inherent in the video codec of both YouTube and the mp4 format.” Just as Lucier “played” a room, canzona “played” YouTube. Each iteration of canzona’s video is available on YouTube. A redux version of I Am Sitting in a Video Room is forthcoming, which should allow users to experience the gradual disintegration continuously from start to finish. The effect may not necessarily be pleasant – but it makes you wonder if doing the same thing to another, more sonically- or visually-rich clip could result in something more beautiful than the original. With an estimated 120,000,000+ on YouTube, the possibilities for this kind of experimentation are endless. Most robots take millions of dollars and years of research to build – but you can get started today on your very own, without any grant writing. And some of the materials you’ll need might be cluttering up your house right now. “Sparky” (an invention of artist Marque Cornblatt) uses a Mac Mini computer for its brain and a TV monitor for its head. The rest is up to you. Marque provides a list of the materials you’ll need and instructions for assembling them at http://www.sparkyjr.com/. It’s not as complicated as you might think. While you’re there, take a look at some of the varied models that have already been constructed. Marque is a self-taught engineer. His first robot was assembled from dumpster-dived trash and discarded technology items. While the list of materials he provides for enterprising followers isn’t quite so basic (or unsanitary), it’s still relatively simple. Marque took Sparky for a spin at SFMOMA with our reporter, Lisa Katayama. So what are you waiting for? This is an opportunity to literally make a new friend. “Sparky” (an invention of artist Marque Cornblatt) uses a Mac Mini computer for its brain and a TV monitor for its head. The rest is up to you. Cornblatt provides a list of the materials you’ll need and instructions for assembling them at http://www.sparkyjr.com/. It’s not as complicated as you might think. While you’re there, take a look at some of the varied models that have already been constructed – like the Pet Care Robot which keeps tabs on your dog while you’re shopping at the grocery store and plays fetch with it. Cornblatt took Sparky for a spin at SFMOMA with our reporter, Lisa Katayama.